Is Philly Ready for Climate Change? | Econsult Solutions, Inc.
Just two months into the new year, Philadelphia has already experienced a near-record weather event – the January 23 snowstorm that brought 22 inches of snow. Philadelphia residents can expect more events like this in the future, according to a report that was issued in December by the City’s Office of Sustainability: Growing Stronger-Toward a Climate Ready Philadelphia. The report includes both some eye-popping findings and important recommendations to City officials for dealing with the issue of climate change. The Growing Stronger report uses widely accepted climate data to project scenarios for Philadelphia over the short, medium and long terms. One of the key findings is that Philadelphians can expect to have hotter summers and wetter winters in the future, a trend that has already begun. Indeed, since 2010, Philadelphia has experienced numerous types of extreme weather, including the snowiest winter on record, the two warmest summers, the wettest day, and the two wettest years on record, as well as two hurricanes. Forty-nine daily high temperature records have been set in Philadelphia since the year 2000, 18 of them since the year 2010. One recent example was Hurricane Irene. In August of 2011, Irene hit Philadelphia and caused widespread power outages and major flooding across the city. Costs to City government included nearly $50,000 of damage to city vehicles, $124,000 of damage to the Streets Department, and $330,000 of damage to city parks. SEPTA was forced to cancel all service on August 28 and was affected by downed wires, downed trees blocking rail routes, service disruptions from flooding and loss of signal power on the certain lines. PECO reported that 139,000 area residents lost power due to downed power lines. 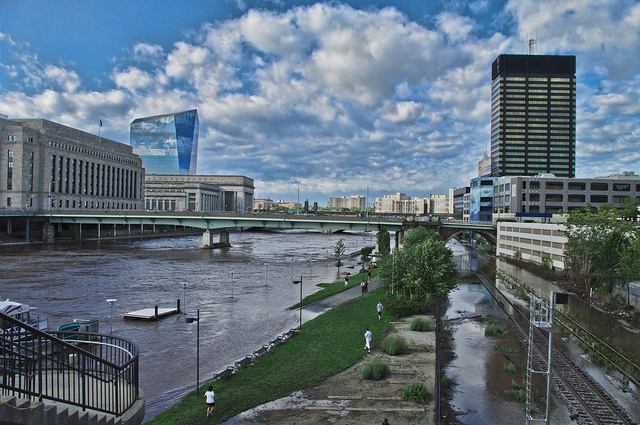 These higher temperatures and increased flooding can be expected to affect Philadelphia’s citizens and the cost of City government in a variety of other ways. For example, high temperatures negatively affect health by increasing heat-related deaths, particularly among the elderly. High temperatures can also affect air quality which increases asthma –a problem that is particularly acute in Philadelphia, with one of the highest childhood asthma rates in the country. Conversely, cold winters can add costs to the City budget by increasing the need for salting and snow removal. In fact, snow plowing in this year’s January snowstorm exceeded the City’s entire budget for snow plowing for the current fiscal year. Also, as most Philadelphians have noticed, extreme temperatures, snow, and freezing rain during recent winters have caused a record number of potholes which need to be filled. Another change in the climate – wet weather and rising sea levels – will create a range of challenges, especially along the Delaware and Schuylkill Rivers. The report analyzed which City assets are most vulnerable to flooding and concluded that by the end of this century, more than 30 city-owned facilities would be highly or moderately vulnerable to flooding from sea level rise alone. Combining sea level rise with storm surge from a hurricane or tropical storm would place hundreds more facilities at risk. As one example, many of the Philadelphia Airport’s terminals are at risk of flooding in the likely climate scenarios. All of this comes with a price tag. The report estimates that hotter weather could raise the cost of air conditioning in city buildings by a million dollars per year and up to four million dollars per year in roadway maintenance. The cost to the public and private sectors from a single hurricane could be as high as two billion dollars. The report makes thoughtful, data-based recommendations about ways that City officials can address these climate change challenges. Indeed, many City departments have already begun to tackle these issues. For example, the Water Department has created a climate change adaptation program to protect the City’s drinking water. Its nationally-recognized “Green City, Clean Waters” program has encouraged rain gardens and green roofs to deal with climate issues. But many departments will require additional funding and need to begin to think about climate issues in a different way. For example, the report notes that the City’s Finance and Planning Departments will need to incorporate climate issues into their budgeting and planning processes. Thanks to the leadership of many City officials, the Growing Stronger report provides an excellent first step. The Kenney Administration has the opportunity to build on this important work to address climate change. As a member of City Council, Jim Kenney was a strong supporter of the City’s sustainability work. As Mayor, his leadership on this issue will be more essential than ever. Terry Gillen was formerly the Executive Director of the Philadelphia Redevelopment Authority and a member of the Philadelphia Climate Adaptation Working Group.